I gotta start with the bad news because I would hate to end on a sour note. This will be my last post for about a week (probably less). I have been using my phone camera for photos and I no longer have a charger so I gotta keep it off. But the next time I post – HOPEFULLY I’ll have real pictures taken from a real camera. And I’ll be back in the wonderful USA (that’s the good news)! I leave Australia in 3 days. THREE days. I cannot believe that. I am very anxious to get home to some nice crisp weather (unlike this humid hot mess we got goin’ on over here). CANNOT wait to see my family and friends! I went to the store for some last minute souvenirs and ended up finding a very cheap piece of a pumpkin (to cook haha that sounds weird, but it was not even 60 cents) and a sweet potato. YAY can’t wait to cook those up tonight for a nice comfort dinner. I’m planning on sautéing them together with a little honey and cinnamon (yep, sweet indeed). OH and (more good news) I also bought my favorite snack in the world: BHUJA SPICY PEAS. I am going to attempt to keep them sealed until at least Wednesday. Ha, let’s see how that goes. They’ll be perfect for the plane(s) though. Along with the newest Cosmopolitan Magazine – it’s the January 2012 (Australian version – good souvenir, too 😉 ) issue and I am definitely refraining from reading it before I get on the plane. Lots to look forward to! So like I said earlier, I was feeling quite ill this morning. I keep trying to figure out why and maybe it’s my iron deficiency? The doctor said it’s not extremely low, but it’s the only thing I could come up with. So I ate my last frozen burger for lunch. Animal meat has the best kind of iron for your body. It’s the most easily digested, especially red meat. So yes – perfect pick-me-up! I feel better already! 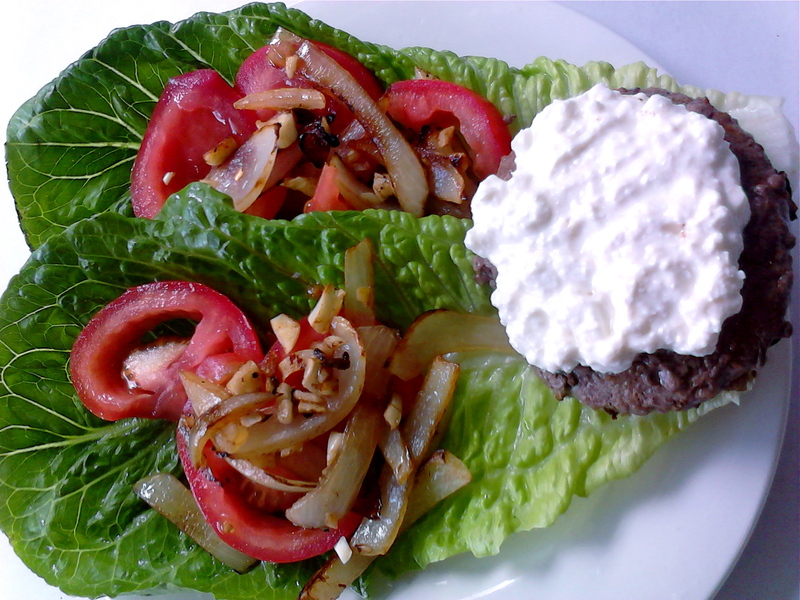 I topped this burger with melty cottage cheese! 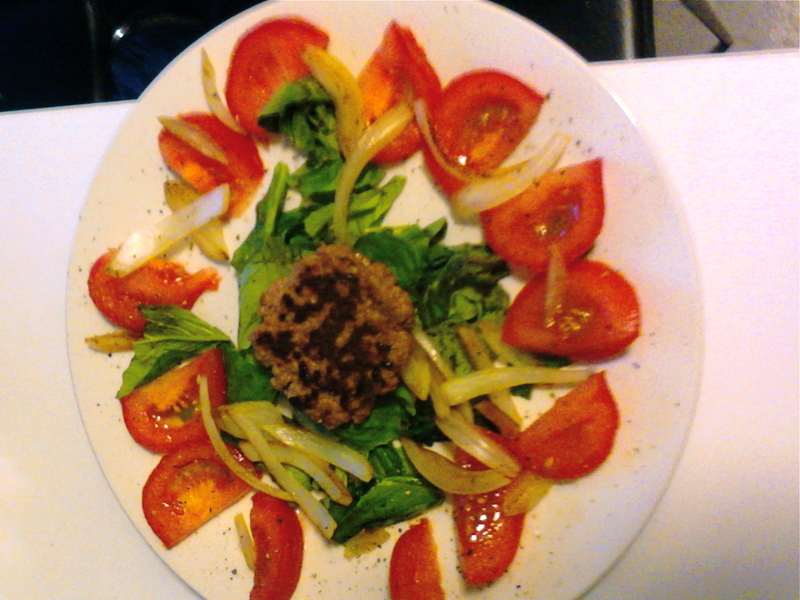 On the side is two Cos Lettuce leaves with a whole tomato and sauteed onion and garlic. Hearty, me likey. 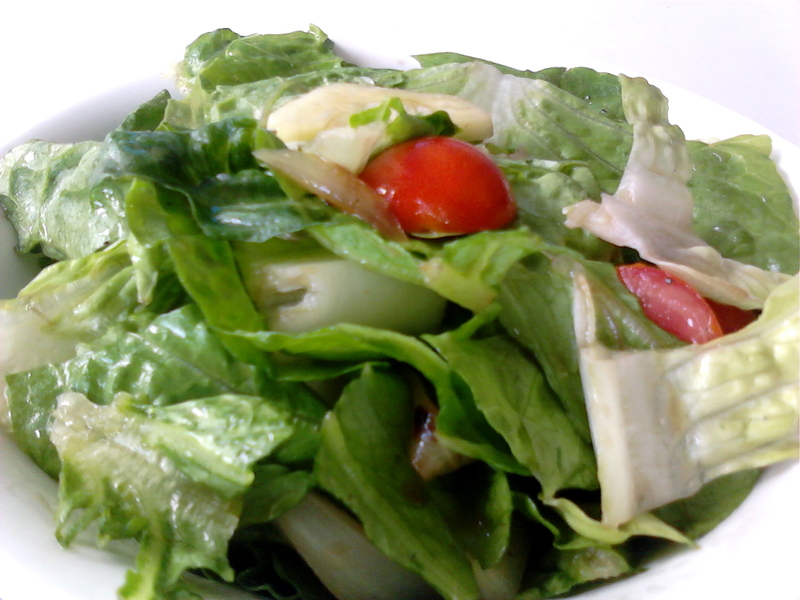 A salad with yet MORE tomatoes and onions, along with cucumber. Dressed in lemon juice, evoo, salt, pepper & garlic powder. This meal tasted like I was eating “taco bell”…except not really because nothing compares to Taco Bell. Did you know there are no Taco Bell’s in Australia? I know, I’ve been deprived for over five months….! 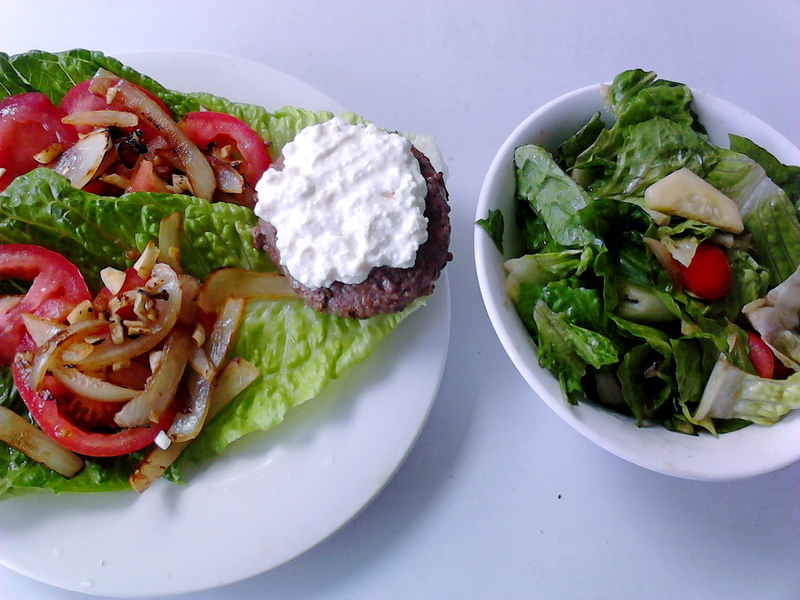 Any who, I rolled it up just like a taco, half of burger in each leaf. Holy YUM! Then I slapped on Siracha for some spice. Very satisfying, I think it was exactly what I needed. I’m so not cut-out to be a vegetarian. 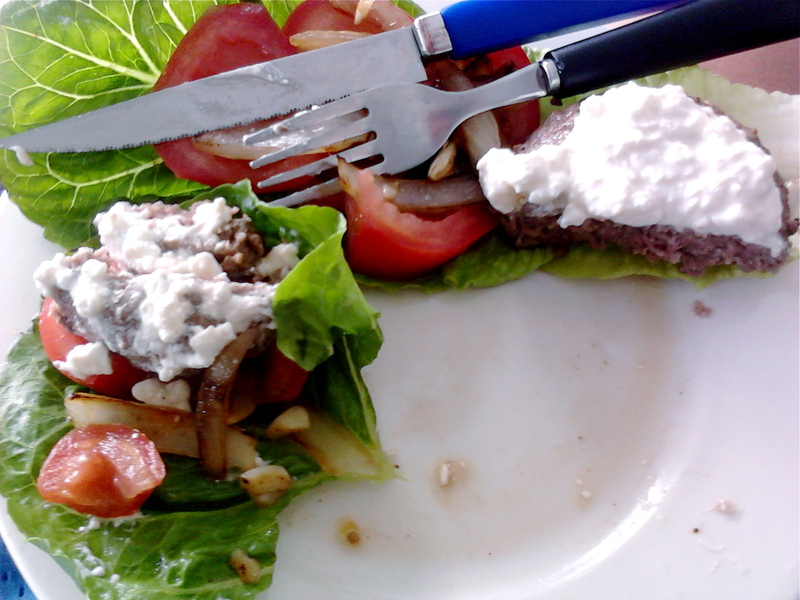 Meat is too yummy and fuels me so nicely (speaking of which – I haven’t had plain chicken in such a long time. Or salmon, which is not ‘meat’ but I’m getting my hands on some when I get home!). Okay now I want chocolate. Ugh. Guess what happened? My camera broke. Actually it’s my Mom’s . . . sorry, Mom!!! She let me borrow her camera for my time abroad here in Australia because mine broke a month or so before I departed. I must be cursed. I went to turn it on and the lens just got stuck… out of nowhere! I’m charging it now, so hopefully the battery is just dead? Say your prayers…please. Otherwise, until I get a new camera (and um I’m broke… so it could be a while – unless my Dad let’s me use his…please?) I’ll be using my phone and/or webcam! Sad story. I woke up this morning feeling like I had mono again. I also felt like that last night. I actually got mono last March so it’s been about 9 months or so since I’ve had it. Once a person gets it, they can’t get it again. But that’s exactly how I felt, seriously achy and completely nauseated. Ick, I feel better now (2 hours later – I woke up at 5am!?!?) after taking Motrin, Tylenol, eating breakfast & drinking green tea. I wonder what the remedy was? Maybe a combo of all of them. Alright. Food. Reminder: the following photos were taken with my phone camera or webcam (this is a judgement free zone people). K moving on. 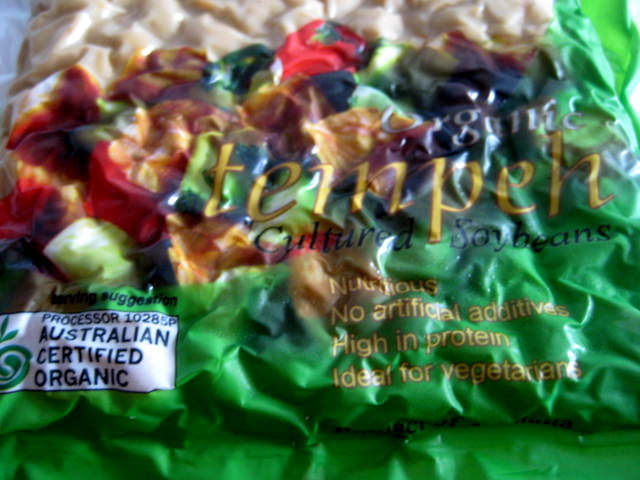 Has anyone tried tempeh? It’s like a soybean patty. That sounds so gross but it’s not that bad. I saw it in the store on sale (in the cheese section? ), so I wanted to try it after hearing about it from Allie. I had this yesterday for lunch. 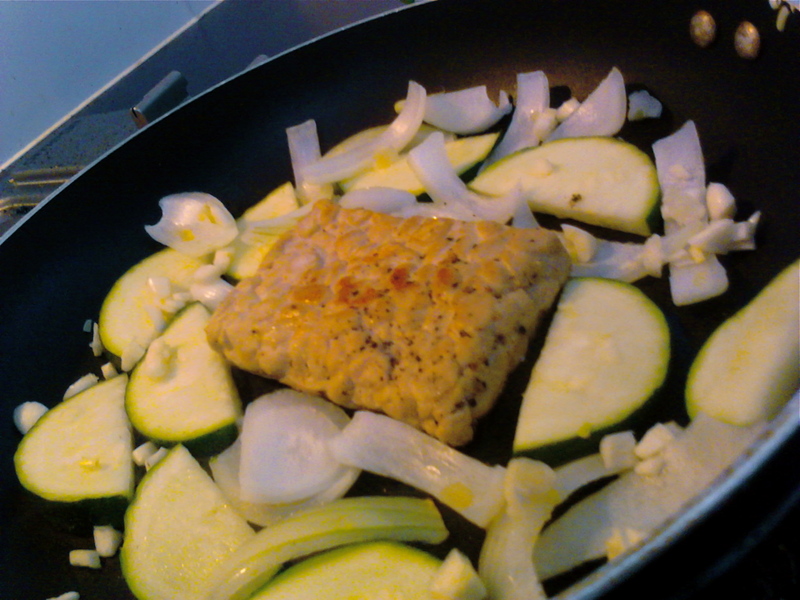 I cooked it with zucchini (the last of it…sad face) and onions. I also marinated it in the fridge with EVOO, garlic, salt & pepp for a bit before cooking. It can be eaten raw, but I’d rather not. It turned out pretty good. For you texture-picky people out there…eh. Not sure if you’d like. It’s way different than tofu because it is more …beany. I am not sure I’ll purchase it again – didn’t love it. 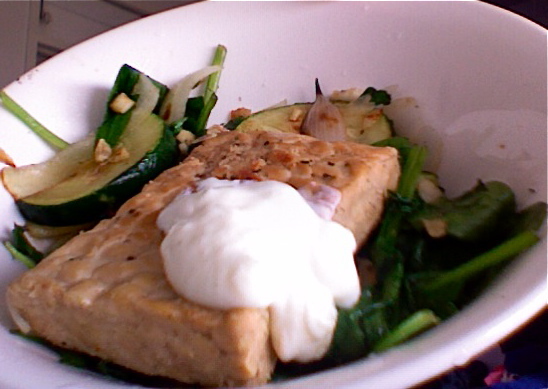 But of course anything with tzatziki (and zucchini) is magnif. Love tzatziki. And for dinner I had some real meat! I think my body was craving it so I decided to have half of a burger. 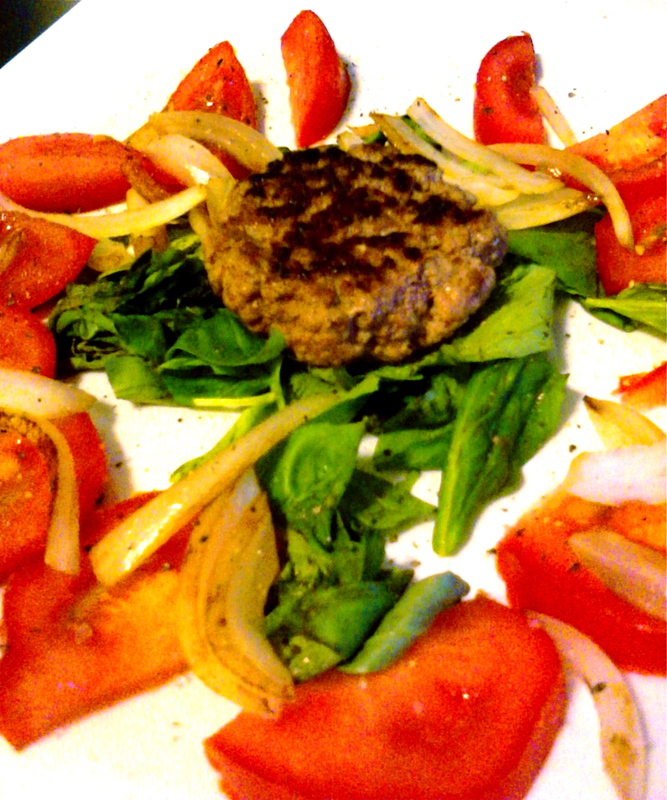 I ate it with a bunch of basil leaves, raw tomatoes, and onions that I cooked in some of the fat from the burg. I added some spicy mustard after I took these pics and that was quite delightful. Wow – look at that perfectly balanced meal. We have one egg white, one over-easy egg (my very first time making over-easy eggs, I usually stick to sunny-side up because I’m afraid I’ll break the yolk but I didn’t! 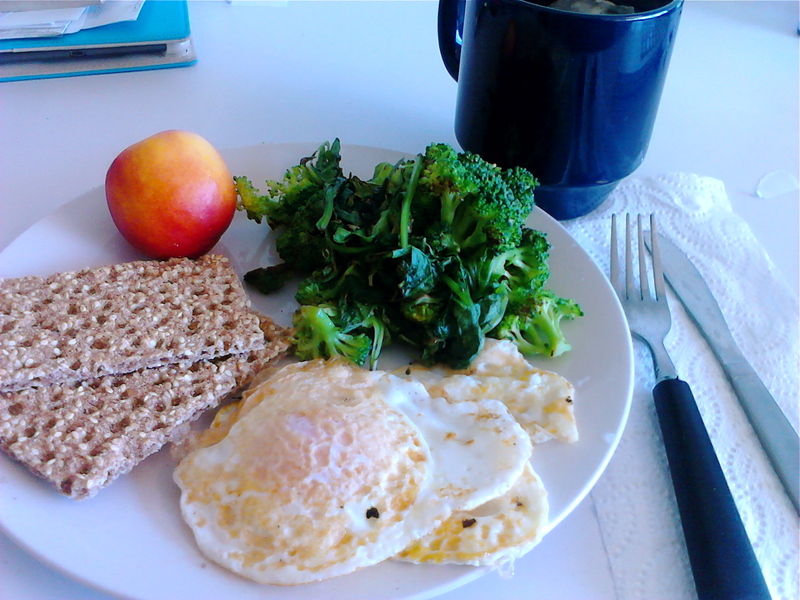 ), brocooli & greens, sesame rye crisps, a nectarine, and green tea. 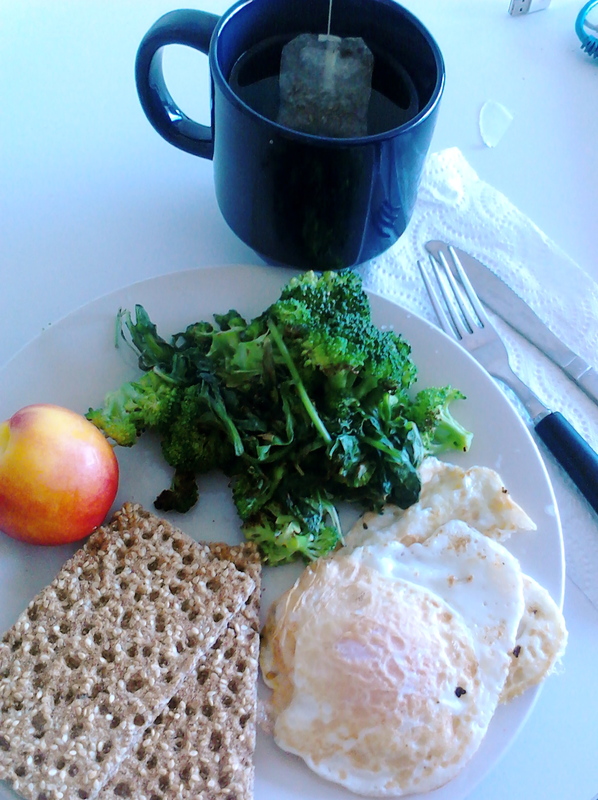 My favorite part of course is poking the egg to make it all runny. I layered it on a sesame rye crisp with some greens. 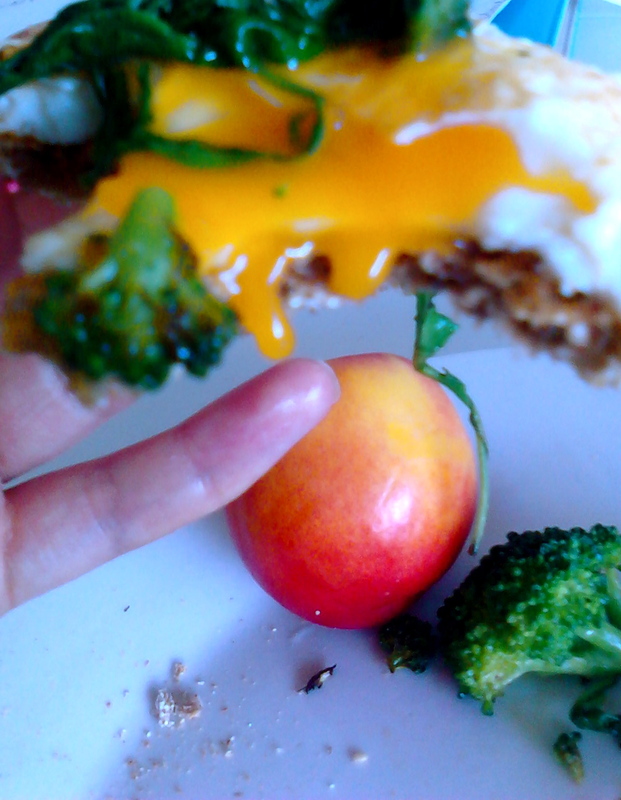 The beautifully bright orange yolk tastes like cheese sauce. OH YES. 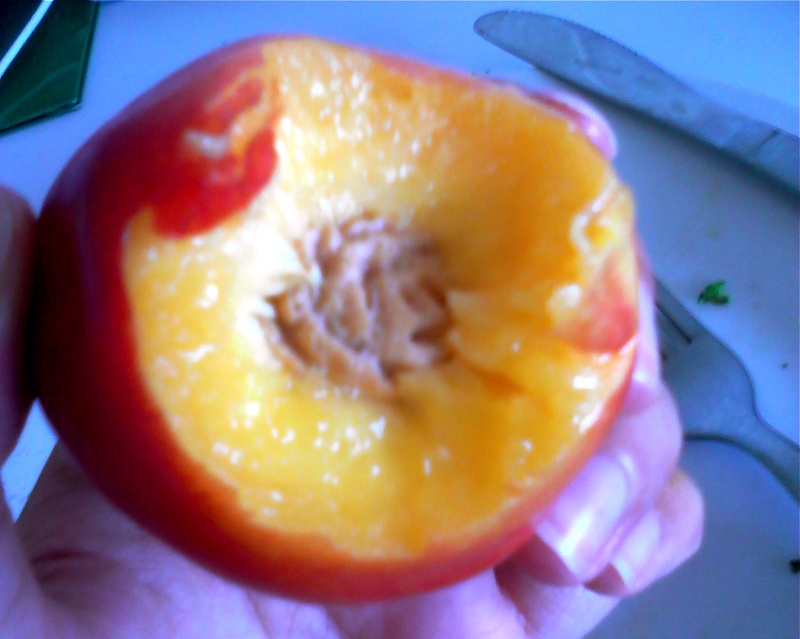 And the perfect sweet ending to this savory dish was a very juicy nectarine. I’ve had a bunch of these in the fridge for weeks and they are definitely staying fresh! Sweet. 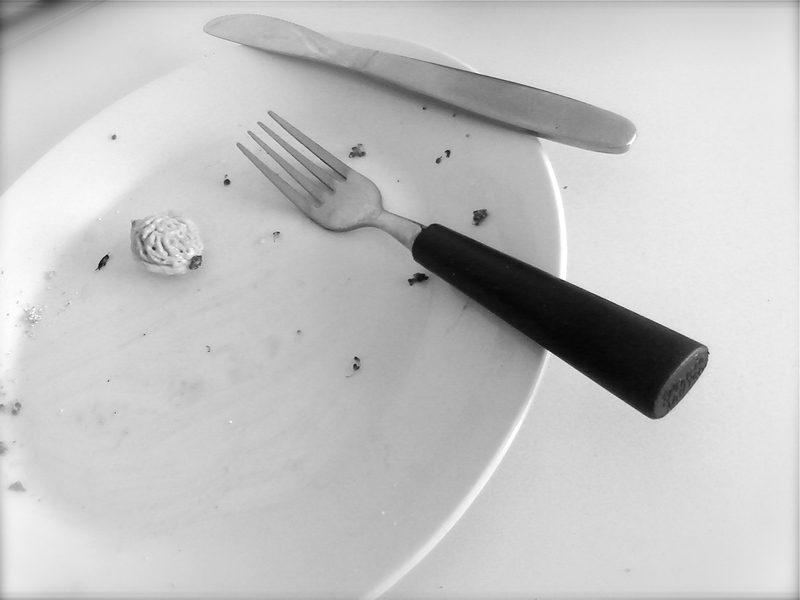 Isn’t it funny to look back at our childhood’s and remember our parents begging us to finish our meals? Well, Mom… you have definitely won that battle. Nothin’ but pit! Hope everyone’s December is off to a kick-a$$ start. Christmas shopping? I love buying for others (ugh, but again I’m so broke…). Oh well, today Steph and I are going to a market to hopefully find some cheap souvenirs. Boomerang, anyone?